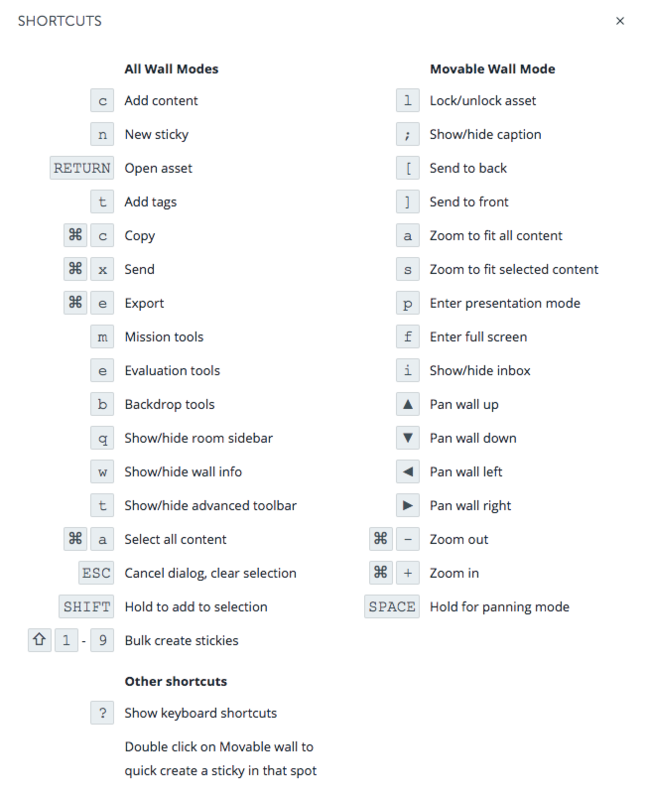 Shortcut tips will pop-up quickly with a click on “Shortcuts” from the Profile drop down or simply click shift + ? and the shortcuts will show. These tips will help any user. Create ONE Note - Create one new note and set the color and size (S, M, L, XL) then hit SHIFT+Return. This will save the current note and instantly create a new note with the same color and size in the center of your screen. Multiple Notes - Create multiple notes by clicking SHIFT + # - e.g. SHIFT+4 will create 4 notes. Choose the appropriate number 1-9 to rapidly create up to 9 notes at a time. Notes will be created in the color in which your last note was created (default is set to yellow). Double-click on a moveable wall and a note will be created. Note color and size will be created to match the last note created/edited. Clicking and dragging will draw a selection box around wall assets by default. Single clicking an asset will select only that asset. Double clicking an asset will open its details dialog. Hold SHIFT then click to select: Add/Remove assets from the current selection set. Hold the SPACEBAR and click-and-drag to pan around the wall. When done moving your view, release the SPACEBAR. Use the Up/Down/Left/Right arrow keys on your keyboard for precise wall movement. Using your trackpad or a touch scroll area (if using an Apple Magic Mouse), use standard two-finger swipe gestures to pan in any direction. Scroll up/down with trackpad or mouse wheel. Hold ALT and scroll up/down with trackpad or mouse wheel. Zoom In on Selected Assets: Select wall items (selected will have blue box around items) and click s.
Zoom Out to View All Wall Assets: Click a .